The most fearsome sight in the Dominican Republic? Two guys on a motorcycle riding slowly through a neighborhood. The modus operandi is always the same: the guy on the back of the motorcycle pulls a gun and quickly jumps off, grabbing what he can before disappearing at high speed after jumping back on the back of his escapecycle. The Dominican government, in order to solve this problem, has done what could only be expected in North Korea, it has banned people from letting others ride on the back of their motorcycles without the proper government permit. Starting on the 15th of this month, a person who wants to give a casual ride to a friend from one part of town to another will first have to acquire a permit from the Dominican Terrestrial Transit Directorate. The new transit directive, described as onerous by large segments of the population, will make it extremely difficult for people in remote mountain villages to move about the country, effectively making it impossible for some people without a license to travel from a rural area to a town where bus lines operate. Moreover, the government will now mandate that both passengers wear helmets, making it impossible for some women to make it to work, since curly (natural) or unkempt hair is highly frowned upon in the Afro-European society, where European beauty standards and its demands for straight hair predominate. According to Dominican government statistics, 70% of accidents in the country are motorcycle-related, and one of the stated objectives of this new transit law is to decrease the number of accidents. However, this new law doesn't solve the problem of mountain roads in a high state of disrepair, nor does it solve the problem of drunk, large-vehicle-drivers plowing down two registered people wearing helmets on their motorcycle. 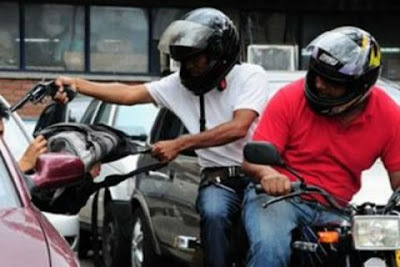 Although 80% of muggings are committed by motorcycle duos, the only way to prevent people from riding unregistered is by setting up checkpoints and impounding the motorcycles of people simply trying to go about their regular business, something which the government plans to do. Maybe this law will actually save thousands of lives in the long run, but it will significantly alter the culture of the Dominican Republic, and it will also make social mobility a much more difficult endeavor for those living in the poorest parts of the once-safe island.